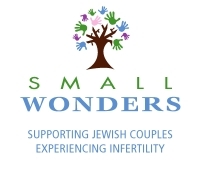 Small Wonders is an organization that supports Jewish couples experiencing infertility. We provide emotional support, education, and financial assistance. Prior to beginning the formal application process we would like some basic information from you. This will help us in a very preliminary way to assess if and to what degree we may be of assistance to you. After reviewing the information you provided to us we will contact you and if appropriate will initiate the formal application process. * Small Wonders does not provide funding for any third party reproductive procedures. Please keep a copy of your application by copying and pasting it onto a word document.